Attorney Anne E. Burke has substantial experience representing individuals in a wide spectrum of family law matters in Overland Park and the greater Kansas City area. She is committed to representing clients with compassion, legal acumen, and efficiency. With extensive experience in every area of family law, including pre-nuptial and post-nuptial agreements, divorce litigation and mediation, alimony, spousal support, child custody and child support, and support modifications, Ms. Burke can provide comprehensive and effective legal counsel. 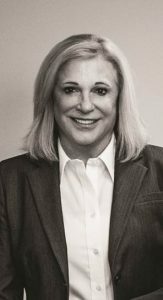 Ms. Anne Burke received her Bachelor of Arts Degree with honors and distinction from the University of Kansas in 1978 and her law degree from University of Kansas School Of Law. Ms. Burke is a fellow in the American Academy of Matrimonial Lawyers, a nationwide organization of lawyers carefully selected and acknowledged to be premier matrimonial attorneys. Best Lawyers in America, the oldest and one of the most respected peer-review publications in the legal profession, has listed Ms. Burke since 1995. She has also been listed in Super Lawyers for Kansas since 2007, making her among the top 5 percent of the Kansas and Missouri attorneys so designated. She is a fellow in the Litigation Counsel of America, and a frequent speaker and writer in the area of divorce law. Ms. Anne Burke has been active with the Kansas Bar Association. She served on the Kansas Bar Association Board of Governors from 1996 to 2006 and as Secretary/Treasurer in 2007. Ms. Burke is also a past recipient of the bar association\'s Outstanding Service Award. She has served as president of the Kansas Bar Foundation and is a fellow of the American Bar Foundation. The Kansas Supreme Court selected Ms. Burke to serve on the Family Law Advisory Committee to the Kansas Supreme Court Judicial Council. In 2009, Ms. Burke was elected to Chair the Supreme Court Nominating Commission which evaluates applicants for vacancies on the Kansas Supreme Court. Ms. Burke is AV rated in Martindale Hubbell. Ms. Anne Burke was admitted to the Kansas bar in 1981. She is licensed to practice in all courts in Kansas and the U.S. District Court for the District of Kansas. Various Family Law CLE courses with the Kansas Women’s Attorney’s Association. She also authored Marital and Parental Torts with an American Bar Association publication and co-authored The Effect of Bankruptcy on Divorce Planning with the Kansas Bar Association. For further information on how Overland Park Attorney Anne E. Burke can make a difference for you, contact Burke McClasky Stevens now at (913) 242-7522.